After Monday’s road game against the Chicago Bears, Philadelphia Eagles’ rookie QB Carson Wentz proved he’s the real deal. The Eagles traded up in April’s draft to take Wentz with the second overall pick. The team then traded their established QB Sam Bradford to the Minnesota Vikings just 8 days before the start of the season, and thrust Wentz into the starring role. Their gamble seems to be working out. He’s the first rookie ever to win his first two games in the NFL without throwing an interception. Eagles 29, Bears 14. Not only are the New England Patriots expected to start a rookie QB next weekend, but now the Cleveland Browns are in the same boat. Robert Griffin III (RGIII) was supposed to be their superstar but he went down in the first game with a broken bone in his shoulder. Josh McCown took over but then suffered his own shoulder injury this past weekend. If McCown doesn’t get better, rookie Cody Kessler (third round pic in this year’s draft), will start. If injuries continue to plague quarterbacks in the League, Tim Tebow might want to reconsider his new baseball gig with the NY Mets and come back to lead a Team. Georgetown University has a unique package for fans of basketball who want a memorable wedding proposal. 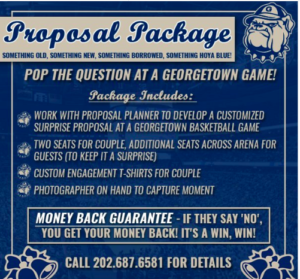 They are offering up a “pop the question” package where a planner will work with you to propose during a Hoyas game. The ad even states it’s a win, win, because if your intended refuses your proposal you get your money back for the game.